President Donald Trump met with FEMA this week and he managed to talk about disaster preparedness without ever fully addressing the massive tragedy that occurred, and the massive clean-up efforts that are still ongoing in Puerto Rico. Hurricane Maria has claimed the lives of an estimated 5,000 people on the island. Trump’s administration has attempted to claim that only 64 people were killed. Trump, in leaked audio that lasted nearly 40-minutes, mused about the cost of purchasing military equipment, joked about attacking California Democratic gubernatorial candidate Gavin Newsom, and praised Foxconn for building a new factory in Wisconsin. The President also took a very brief second to stop stroking his own ego to tell his Cabinet members that they were very popular among the American people. During a filmed portion of his talks, Trump did manage to mention Puerto Rico and other states hit by natural disasters. However, he didn’t address the massive increase in the death toll number reported in a recent Harvard study. 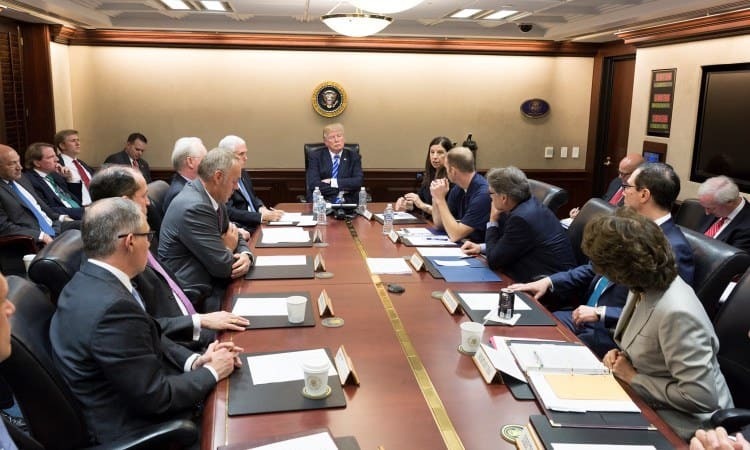 The President continued to praise FEMA officials and Cabinet members for their response to one of the most deadly hurricane seasons on record. “We really appreciate the job you’ve done. I want to thank you very much,” he said. Despite a massive number of deaths, Trump continues to maintain that Hurricane Maria wasn’t a “real catastrophe” for Puerto Rico. The President has gone so far as to say, Hurricane Katrina, which claimed 1,800 lives, was worse.